Welcome to the Renegade Pastors Network Overview where you can learn more about Coaching and the benefits that await you when you abandon average and join the coaching network. Coaching is at the heart of what we do for pastors. 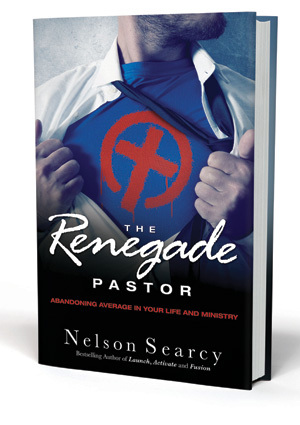 Nelson Searcy launched the Renegade Pastors Network to help you as a church leader abandon average in your life and ministry. Each coaching level falls under the “Renegade Pastors Network” umbrella followed by a designation of Silver, Gold, Platinum or Titanium. No matter where you are in your ministry, no matter where you start on the coaching ladder, you will have a clear path to growing as a church leader, and how you can continually move up based on your current coaching needs. Click the tabs to get an overview of each level or click the Next button below to start at the Silver level. Renegade Pastor Silver is the foundational network — you will carry these monthly benefits forward to each coaching level. This monthly membership program will help you grow as a leader in life and ministry - to maximize your God-given potential. As a member, Nelson Searcy will help you stay one step ahead of the calendar, make the most of your time and resources and fulfill your calling for the sake of the Kingdom. At the heart of the Silver level is a focus on abandoning average to fulfill your calling, while achieving personal growth and ministry-life balance; includes two monthly group coaching calls. Online Private Membership Hub Access In your password-protected membership site, you’ll have access to exclusive benefits like recordings of the monthly calls, members bonus kit archives, in-depth book summaries and more! Monthly LIVE Leadership Briefing Call with LIVE Q&A Your don’t-miss call with Nelson, jam-packed with the latest leadership lessons, encouragements, challenges and pitfalls to avoid. Monthly Equipping Interview Call A one-hour interview call with key pastors, writers, theologians and secular thought leaders. Get this book FREE when you join today! Renegade Pastor Gold level is a growth-accelerating network for those Senior Pastors who are serious about leading their church to its full redemptive potential. Current Gold Coaching is Full. The Next Gold Coaching Module - Starts Wednesday, May 1. *Coaching episodes will be available On-Demand. So, if you are not able to make the live coaching on the dates listed above, they will be available in members website for On-Demand Viewing. Read Below for More Details on What's Included in Gold Coaching! Nelson chose Gold for this network because it's proven to be the "keystone" to everything God does through our coaching process. If someone never completes this level, they never really experience all that God can do for them and their church through our coaching ministry. At the heart of the Gold level is an in-depth focus through 12 monthly coaching sessions on the Eight Systems of a Healthy Church to break through the barriers keeping you from growing. On-Demand, Online Coaching Available now via a new on-demand, online module format, where you can participate at your convenience each month. Led by Nelson Searcy, this network is based on the 8 Systems of a Healthy Church that he has identified and taught to thousands of churches, through books, resources and live events. You’ll receive 12 online sessions over the course of this network that you can fully participate in anytime. And unlike other networks, you’ll receive both the audio and video. You can access each session through your private Coaching Hub. After gaining a more thorough understanding of each of the Eight Systems of a Healthy Church, you can immediately start evaluating the strengths and weaknesses of your church. You’ll be able to develop a clear and easy-to-implement plan for the rest of your coaching experience. Nelson will give you immediate next steps that you can take this Sunday to reach and keep more first-time guests in your church. These simple “Big Rocks” will have you seeing immediate results! Stewardship is a big system! In this first part of two, Nelson will give you the basic steps that you can take to implement a healthy Stewardship System that is focused on discipleship as the ultimate goal. You will learn how to create “Big Days” in your church and how to maximize your preaching through a One-Year Preaching Calendar. This session will immediately relieve your stress of having to plan and prepare from week to week. In this second session on Evangelism, Nelson will help you create a culture of Evangelism in your church. If your church has been stagnant for years or is experiencing explosive growth, Nelson will give you the tools necessary to raise the evangelistic temperature of your church. 100% participation – that is the goal of this session. What can you do in your Sunday School or Small Groups Ministry that will help you get 100% participation? In this session, Nelson will share how The Journey (and numerous coaching alumni) consistently exceed that goal, regardless of denomination, location or background! Regardless of your music, creative elements or traditions, Nelson will give you “Seven Ways to Improve the Quality of Your Worship Service.” PLUS, he’ll share four evaluation questions you can ask yourself and/or your staff every Monday so that you can improve Sunday after Sunday. In this advanced session on Stewardship, Nelson will give you time-tested tools that have consistently helped coaching alumni increase their offerings by 27%! Plus, you’ll learn five stewardship decisions every pastor should make to lead an effective Stewardship System. Nelson will give you an effective plan to help increase the number of volunteers in your church. You’ll also learn how to “Create a First Serve” opportunity that will motivate your people to serve. Staffing can bring the greatest joys and the greatest headaches as you lead your church. Nelson will guide you on avoiding the multiple landmines in leading your staff. Even if you don’t have any staff, these are practical steps that you can take to lead your key leaders. You will learn how to create a simple and practical personal growth plan that will help you enjoy your days off, take consistent vacations (where you’re not distracted by ministry) and be more effective each day in your ministry. In this session, Nelson will help you create a church strategy utilizing all the tools that you’ve accumulated during the network. You’ll evaluate the health of each system in your church and what you can do to take them to the next level. PLUS, you’ll receive a “Coaching Blueprint” that gives you specific next steps. There are “Getting Started” next steps that will help you implement the very basics of the system, an “Intermediate Blueprint” that will guide you to implement beyond the basics, and for Coaching Alumni there is an “Accelerated Blueprint” that will help you go even further with each system! Exclusive Benefits As a Gold member, you receive all the Silver level benefits as well as the growth-accelerating Gold-level only exclusives like special mailings, CDs, priority contact with me and Gold-only discount — in addition to your monthly online systems training. Automatic Upgrade to Platinum Plus, after completing 12 months at the Gold level, you are automatically upgraded to the next level, Platinum and we do our first deep dive into Assimilation (or another system should you prefer). Current Gold Coaching is Full. Next Gold Coaching - Starts Wednesday, May 1. The Renegade Pastor Gold level goes further than the Silver and Gold levels — it is a coaching deep dive into ONE focused system. At the heart of the Platinum level is an intensive focus on one specific system or area with in-depth training; will progress from one system to another. Available now via a new on-demand, online module format, where you can participate at your convenience each month. Each network offers multiple online sessions that you can fully participate in anytime. And unlike other networks, you’ll receive both the audio and video. You can access each session through your private Coaching Hub. As a Gold member upgrading to Platinum, you automatically begin with Assimilation (although you may choose another system). When you join Platinum directly you may choose any system to start (such as Stewardship or Worship Planning), with future systems automatically continuing your membership. As a Platinum member you retain all the benefits of Silver and Gold levels plus this intensive in-depth training each month. As you stick with the program, you will progress from one growth-accelerating system focus to another. Upgrade for an in-depth study of the Assimilation System, where Nelson Searcy will walk you through each detail of the process. And much more over the seven months of coaching with Nelson! Upgrade for an in-depth study of a proven system to increase your offerings and grow your church spiritually. Nelson Searcy is with you each step along the way! And much more over the nine months of coaching with Nelson! Mobilize Your Congregation and Equip People to Share Their Faith! Upgrade for an in-depth study of Evangelism to increase the number of people coming to Christ! Nelson Searcy will walk you through each critical step of the process. The seven evangelism mistakes that every church makes and what you can do to correct them! And much more over the 12 months of coaching with Nelson! Upgrade for an in-depth study of Worship Planning & Preaching to increase the impact of your worship services! Nelson Searcy will walk you through each critical step of the process. And much more over the coaching sessions with Nelson! Upgrade for an in-depth study of Leadership & Personal Growth to increase your impact as a church leader! Nelson Searcy will walk you through each critical step of the development process. Get 100% Participation in Small Groups! Upgrade for an in-depth study of the Small Groups system. Kerrick Thomas, Executive Pastor at The Journey Church, will walk you through implementing this system, increasing small group participation and multiplying life change. And much more over the 8 months of coaching with Kerrick! Master the 8 Systems — and Take Your Leadership as an Executive or Associate Pastor to the Next Level! Upgrade for an in-depth study of the top 12 areas that are crucial to your success and fulfillment as an Executive or Associate Pastor. Kerrick Thomas, Executive Pastor at The Journey Church, will walk you through this relationship-based coaching network to improve your competency and increase leadership skills. Bonus resources and private system-specific documents and strategies not available elsewhere. Overcome the 7 Challenges of a Worship Leader — and Take Your Worship Team to the Next Level! Upgrade to lead your worship ministry toward health and growth. Jason Hatley, Executive Pastor of Worship Arts at The Journey Church, will walk you through how to overcome the 7 challenges of a worship leader that he has identified and taught to thousands of churches. And much more over the 12 months of coaching with Jason! Renegade Pastor Titanium level is the only network featuring in-person coaching with Nelson Searcy: 5 times per year, two days of intensive, personalized in-person coaching. Note: the primary factors in attending Titanium Coaching are not church size or location; it’s your commitment to healthy systems and leading the Renegade Pastor lifestyle. At the heart of the Titanium level is personalized, in-person coaching with Nelson and access to ALL NEW resources for FREE plus exclusive recordings, training and gifts only provided to Titanium members. This is Nelson’s highest level network and the only in-person one he leads. Go deep into each of the eight systems; the lifestyle of a healthy pastor; the latest lessons that are taught nowhere else; plus special guests pop in from time to time like Dr. Elmer Towns, Steve Stroope, Rick Warren, Gary McIntosh, Bob Whitesel, etc. Each month you will learn in great detail one of the eight church systems and how it applies to your church. This will be in much greater detail than covered in the regular networks. As a Titanium Coaching member you receive any new resource for FREE and get additional exclusive training and resources only provided to Titanium members. Click “Your Benefit Detail” below for your complete benefit listing that reveals all the exclusives!